He helped build it, and they are definitely coming. It's now 11 PM in cyberspace. Do you know where your children are? He helped build it, and they are definitely coming. It’s now 11 PM in cyberspace. Do you know where your children are? 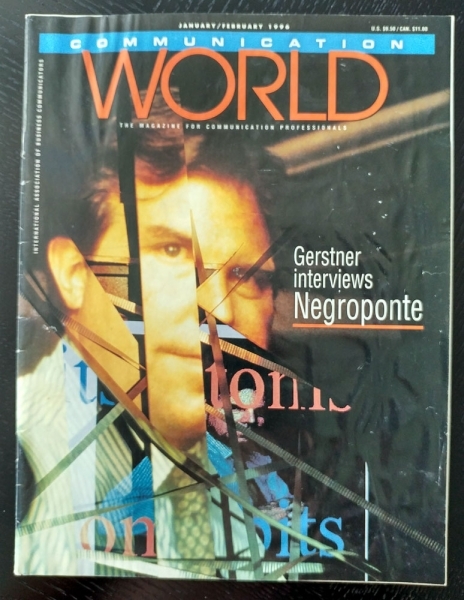 Second in a series of interviews on ‘The Civilization of Cyberspace’ by John Gerstner, ABC (First published in the January/February 1996 Communication World Magazine. Today, the founder and director of the distinguished MIT Media Lab — and arguably one of the founding fathers of the Information Age — spends at least three hours a day, seven days a week inhaling and exhaling E-messages with about as much ceremony as he devotes to the act of breathing. To usher in that era, the Media Lab is launching a new research consortium called “Things That Think” that will look at everyday objects in a radically new light. In this vision, there are intelligent doorknobs that recognize you and open the door so you don’t have to put down your bags. Inside, the lights turn on, and your CD player, sensing your need for relaxation, cues your favorite Mozart piano sonata. The carpet uploads the day’s news into your shoes for personalized delivery to your glasses. Really. Unlike most mortals, Negroponte is in a position to make some of this stuff happen. His world renowned Media Lab is an interdisciplinary research hotbed spawning way-leading-edge ideas at the convergence of computers, telecommunication, learning and entertainment. Negroponte is fond of saying that all communication media and technologies are poised for redefinition, and his life’s work is to help do the redefining. GERSTNER: In “Doing Digital” you use two little words – bit and atoms — to help readers understand some of the digital change we’re experiencing. How do you define the two terms, and why is it important to distinguish the two? NEGROPONTE: Atoms are things you can touch, such as newspapers, magazines, books and videocassettes. Bits are the smallest atomic element in the DNA of information. A bit has no color, size or weight; it can travel at the speed of light. We are definitely in the information age, but most information is still delivered in the form of atoms. Out mind-set about value is driven by atoms. Companies declare their atoms on a balance sheet, but their bits, often far more valuable, do not appear. Strange, but true. GERSTNER: The change from bits to atoms is uncontrollable and unstoppable, and this is causing immense changes. When you borrow a book (atoms) from the library shelf, no one else can read the book until you bring it back. 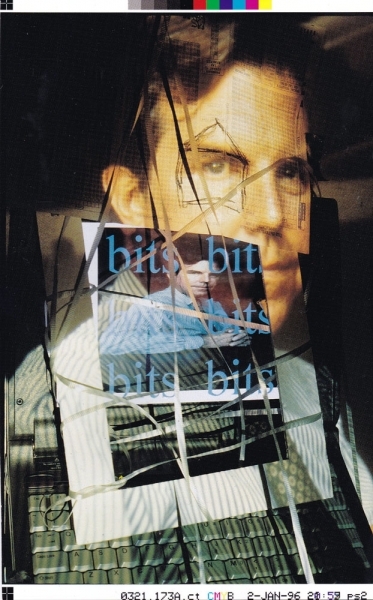 NEGROPONTE: When you check out a book online (bits), the bits remain, accessible to someone else. As more and more things now delivered as atoms become delivered as bits, all this information becomes instantaneously and inexpensively accessible. When information is embodied in atoms, there is a need for all sorts of industrial-age means and huge corporations for delivery. But when the same information is shipped as bits, the traditional big guys are no longer needed. In a world of bits, you can be small and global at the same time. GERSTNER: You have long said the fox machine has been a serious blemish on the computer landscape. Why? NEGROPONTE: The fax machine allows us to ship pages in exactly the wrong way … atoms instead of bits. The fax is a step backward because it is nothing more than a picture of something. It is no more computer-readable than the page you’re reading this on. The same information delivered as an E-mail message takes much less bandwidth to send, plus it can be retrieved, filtered, sorted and edited. You can’t do anything with a fax except read it. GERSTNER: Were you surprised about the explosion of the Internet today and the ramifications? NEGROPONTE: No one predicted what’s happening, not even the founders of the Internet, I think we’re all underestimating the meaning and impact of it. The number of Web sites is doubling every 53 days. This is not a small event. GERSTNER: Do you agree with John Perry Barlow that this is the greatest transforming event since fire? NEGROPONTE: John’s pretty dramatic. I think there is something to that. I think what’s very telling is the way that people in general are responding to it. It turns out that the digital homeless of the United States tend to be very intelligent, affluent and well educated. It’s really the kids, and ironically the elderly, who are getting online very fast. The big slug of people in between, who tend to be the decision makers, executives and politicians, are really out of it. They are not part of this digital world; they don’t understand it. NEGROPONTE: Because they’re wired at birth. The demographics of computing are much closer to rock music than theater. It’s totally generational. The information haves and have-nots have nothing to do with economic distinctions anymore. The control bits of the digital future are more than ever before in the hands of the young. And actually, nothing could make me happier. GERSTNER: Do you worry about people using this advanced communication technology to disseminate disinformation rather than information? NEGROPONTE: Any medium of expression can express things that are not true as well as true, you know. Just because they are bits doesn’t make them truer than if they weren’t bits. GERSTNER: How might the Internet change the role of the journalist? NEGROPONTE: Journalists will have to learn how to write stories in more than one dimension. Right now, you’re off the hook. You can basically make one version of an article and put it to bed. Tomorrow, you’ll have to report the story from multiple perspectives, which will be at least twice the work. . . but very important work. In fact, one of the professions that’s probably going to increase in terms of number of jobs per capita will be journalism. GERSTNER: Is that partly because of the increasing need for more perspective in a rapidly changing world? NEGROPONTE: Absolutely. . . somebody’s got to filter the onslaught of bits. The personal information filter business will be a big business of the future. GERSTNER: What is your definition of information? NEGROPONTE: That’s in the eyes of the beholder. It is that which is meaningful to a particular person at a particular time. If it’s not meaningful people don’t call it “information.” But again, information and understanding do not necessarily go hand in hand. I’m personally more interested in the other side of the equation, which is the understanding. I think it would be nice to spend a little bit more time on the understanding. GERSTNER: I’m curious about your interaction with computers. Is it a love relationship. . . or love/hate? NEGROPONTE: I think my interaction with computers is probably like yours is with air. In other words, I don’t think about it until it’s missing. I just use it all the time. I’m on a keyboard three to four hours a day, minimum, every day of the week, every week of the year. GERSTNER: Are you ever frustrated by computers, with all the new upgrades and gadgets? NEGROPONTE: Oh, sure. I’m frustrated that the last six years of advances in personal computing have resulted in diminishing returns on performance. My old Mac 5I2K went “boing” and it was on. My new computer takes forever to start up. Each new release of an application seems to come with an army of tiny icons, the meanings of which I no longer remember. I’m also frequently frustrated by the fact that I can make a tiny typing error and it doesn’t understand my command. GERSTNER: Are you satisfied with the progress being made in the human-machine interface area? NEGROPONTE: I’ve spent my life worrying about that, and no . . . human input to machines is still Paleolithic. That’s why so many of our parents and friends aren’t wired. We give a great deal of attention to human interface today, but almost solely from the perspective of making it easier for people to use computers I think it’s time to reverse this thinking and ask how to make it easier for computers to deal with people, not the reverse. I advise people to put yourself in the place of your computer. You can lift your hands from a computer keyboard and your computer does not know whether pause is for momentary reflection or for lunch. Your face is, in effect, your: display device; it makes no sense for the computer to remain confined to it. Computers are still vision- and hearing-impaired. It is time we moved on this interface backwater. GERSTNER: Do we know the effect of working with a computer over time? Does it affect such things as human thinking patterns, decision making and writing? NEGROPONTE: There are many answers to that question. I can give you examples of where autistic children use computers to communicate with other children over the Net and gain so much confidence from doing that that they find they can talk to adults in ways they never could before. I can give you examples of somebody like myself who has been on the Internet for 25 years. It makes my life very independent of space and time. In other words, it isn’t a nine-to-five, Monday-to-Friday life. It’s much more integrated. Sometimes I’ll stay in my pajamas until noon. Sometimes I work all weekend. That kind of lifestyle might have been associated with a studio painter at the turn of the century. Now it’s becoming part of. . . banking. There are so many effects. I find myself very impatient by having to wait that millisecond while the computer brings up the next screen. GERSTNER: Does this impatience carry over into your personal life? NEGROPONTE: I wonder? That’s a very interesting question. . . sort of do you tolerate fools less? Maybe. It’s a nice thought. GERSTNER: How far are we on this continuum toward intelligent machines? NEGROPONTE: Thinking of it as a continuum is exactly the right way to do it. This continuum is a mile long and we’re only a few inches down that mile. There’s a long way to go. GERSTNER: Are the PC and TV becoming one machine… a PC-TV? NEGROPONTE: I may be a little bit PC-centric on this question, but it makes no sense to think of the TV and the PC as anything but one and the same. They are both processors; they both deal with bits. The real difference is in the viewing experience. The TV set is a PC you look at from the sofa. It’s more important to focus on the broadcasting side. We won’t be pushing bits at people like we do today. The Media Lab is now 10 years old. Is it just beginning to be understood? Whether the Media Lab is understood or not understood is not something I’ve paid much attention to. I think that it’s fair to say that 10 years ago we were considered sort of all icing and no cake. Now 10 years later I think people are understanding that what we’re dealing with is pretty deep. Just because it sounded like color in motion doesn’t mean that it’s superficial topping. GERSTNER: Where do good new Ideas come from? NEGROPONTE: That’s simple. . . from differences. Creativity comes from unlikely juxtapositions. The best way to maximize differences is to mix ages, cultures and disciplines. That’s why you’ll find at the Media Lab a mix of engineers, artists and scientists who collaborate, not compete. GERSTNER: Stewart Brand’s hook on the Media Lab quotes computer visionary Alan Kay saying that the way to improve is to get the first good image of the thing that is least prejudiced by what we already know. Do you have any advice on how to do that? NEGROPONTE: Alan is brilliant in his remarks like that. The corollary to that, which I would credit to Marvin Minsky, is that the way to implement what Alan said is to make sure that you understand things from more than one perspective. This is something that corporations are very bad at doing. GERSTNER: Do you have advice on that? NEGROPONTE: Seeing things from more than one perspective? I think it requires looking outward more than companies do, and I hope the Internet and the Web helps that. Corporate America spends too much in meetings with itself. New concepts and big steps forward come from left field. The global landscape is the most fertile ground for new ideas. GERSTNER: What’s the best future that you can imagine? What would it he composed of?